THE MACMASTER LEAHY KIDS ARE MARY FRANCES, MICHAEL, CLARE AND JULIA. 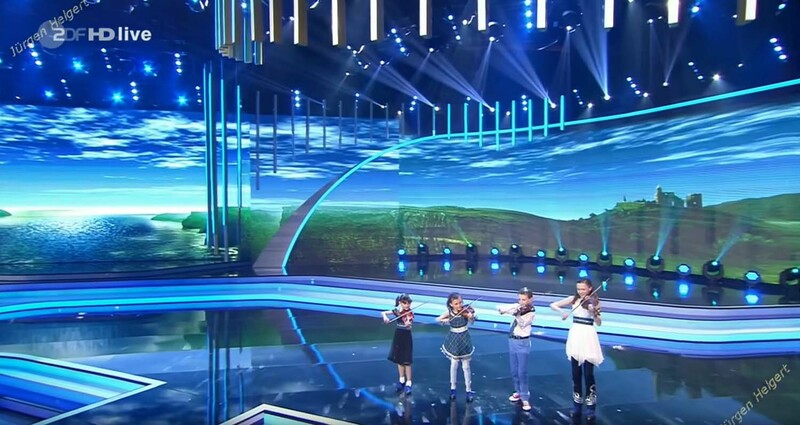 THEIR FATHER IS THE EXTRAORDINARILY GIFTED FIDDLER FROM LAKEFIELD, ONTARIO, DONNELL LEAHY, AND THEIR MOTHER IS NATALIE MACMASTER, THE AWARD WINNING FIDDLER FROM CAPE BRETON, NOVA SCOTIA. THE KIDS ALL STEP DANCE AND PLAY FIDDLE, AS WELL AS A VARIETY OF OTHER INSTRUMENTS. THEIR HOMESCHOOLING ALLOWS THEM THE FREEDOM TO GO ON TOUR AS A FAMILY AND THE KIDS OFTEN APPEAR ON STAGE WITH THEIR PARENTS. THEIR INTERESTS INCLUDE HOCKEY, SOCCER, SEWING AND COOKING, GYMNASTICS AND FIGURE SKATING AS WELL AS PLAYING WITH LITTLE BROTHER ALEC AND LITTLE SISTER SADIE. WHEN NOT ON THE ROAD THEY LIVE THE LIFESTYLE OF A TYPICAL CANADIAN FARMING FAMILY IN THEIR RURAL VILLAGE HOME. THE KIDS MADE AN APPEARANCE ON THE 2017 SEASON OF NBC’S LITTLE BIG SHOTS.